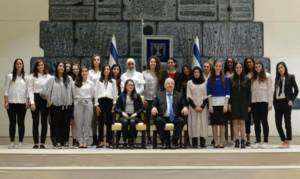 On the occasion of the International Women’s Day, 22 leading female students from across Israel were invited, as representatives of the future generation of Israeli women, to take part in a special activity held at the residence of the Israeli President, Mr. Reuven (Rubi) Rivlin. The students, representing the full range of sectors and social groups to be found in Israeli society, all have an impressive record of extensive social activity in a variety of fields which are crucial to Israeli society. Each student was chosen to assume the role of a government minister. The nominee for Minister of Education was Fahima Amarin, a student at Sci Tech Ramla Arab Comprehensive High School. Fahima is a leading student at the “Learning Mothers” project, which helps illiterate mothers to study Arabic and Hebrew. Fahima helps these mothers in their studies, and even gets activities organized for their children during their classes. Additionally, Fahima promotes Jewish-Arab partnership through collaborative work in Civil Studies with a schhol in Holon; prepares ninth-grade students for taking on extended Mathematics studies in high-school; does research on violence towards women in the Arab and Jewish sectors, and teaches lessons to students aiming to raise awareness to this issue. 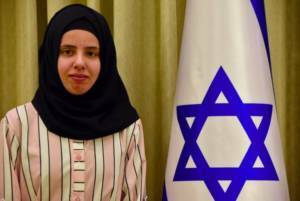 She participated in the Massa-Massar Project, when a small group of students from various sectors investigate various issues of Israeli society during a three-day hike. All this on top of Fahima being an exceptional student, taking extended courses in English, Hebrew, Arabic, Biology, chemistry, Bible studies, and Math. 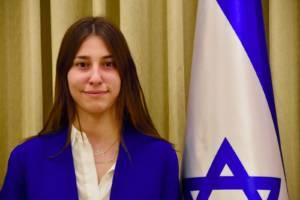 The nominee for Minister of Public Security was Hannah Kopel, a student at Sci Tech Amirim Beit-She’an. Hannah studies in a High-Achievers Program aimed to train prospective military officers (“Atuda”), majoring in science and technology. Additionally, Hannah leads the “Screen Savers” project, which teaches students how to deal with cyber bullying. She had found her way to this project after being subjected herself to severe bullying. She is also active in the “Junior Screen Savers” program, training fifth- and sixth-graders as “ambassadors” for addressing cyber bullying in their schools. She gave talks about this issue in several conventions, including one at the Google headquarters in California. The nominee for The Minister for the Development of the Negev, the Galilee and the Periphery was Diana Alhamidi from . Diana promotes an agenda of education (as well as higher-education) in the Bedouin village where she lives, despite the many difficulties and challenges this issue raises. She leads actions for advancing closer ties between the Bedouin Diaspora in the Negev and the Israeli society at large. 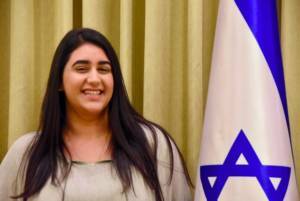 The nominee for Minister of Aliyah and Integration was Noa Taganya from Sci Tech Kiryat-Bialik Comprehensive High School. 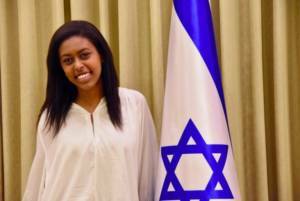 Noa strives to connect the older generation who made Aliyah from Ethiopia with the younger generation born in Israel. She also does voluntary work with holocaust survivors. 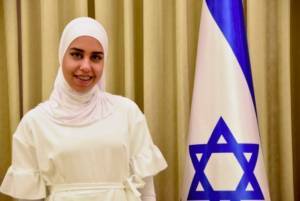 The nominee for Minister of Regional Cooperation was Catherine Cheskov, a student at the Sci Tech Alon Ben Guryon Comprehensive High School in Afula. Catherine takes part in an international delegation of Jewish, Israeli-Arab, and Palestinian girls. During last summer, she represented her school in a month-long summer camp ran by the Creativity for Peace association in New Mexico. This camp was attended by Israeli girls alongside girls from the Occupied Territories, and together they held discussion groups on the Israeli-Arab conflict. This program aims to get the girls together for a meaningful and enlightening discourse’ and to empower them through further joint seminars throughout the year, addressing various topics such as vision, leadership, female empowerment, and more. 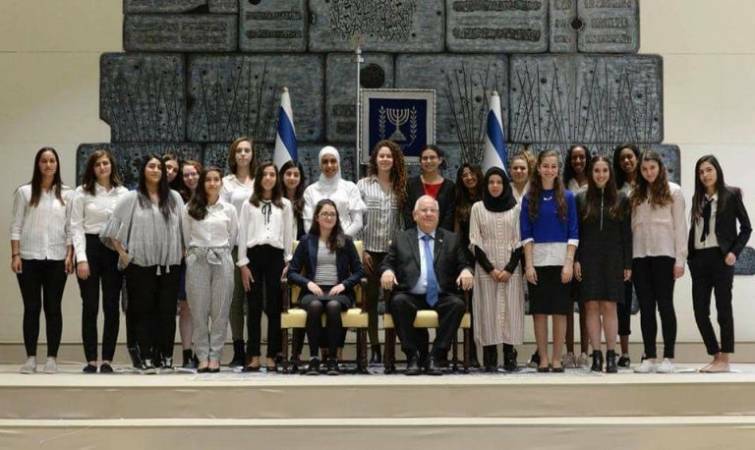 President Rivlin listened to what each girl had to say, shared his experience in the relevant field, and said: “you have among you girls from the North and the South, from the center and the periphery. You represent the full range of sectors and social groups in Israeli society. But you are special, mainly because of the extensive social activity you’re already engage in, at such young age. Photos from the Facebook page of Reuven Ruvi Rivlin.